In the early years of the United States of America, a lack of gold coinage forced citizens to utilize an unusual but practical source. Known as regulated gold, these were foreign gold coins adjusted by respected goldsmiths to weights compatible with US dollars. An NGC-graded XF 40 $15 regulated gold piece made from a Lima, Peru, cob 8 escudos dated 1741 by Boston goldsmith Joseph Edwards, Jr., ca. late 1700s. One such piece, an NGC-graded XF 40 Lima, Peru, cob 8 escudos dated 1741 struck during the reign of Philip V of Spain and regulated by Boston goldsmith Joseph Edwards, Jr. (1737-1783) to $15 in circulating value, will cross the auction block in Daniel Frank Sedwick’s Treasure Auction 23. The sale will be held online at auction.sedwickcoins.com on May 15-16, 2018. The auction firm’s estimate for this coin is $100,000 and up. "This is a very important piece for both the Spanish colonial coin collector as well as the US collector," said company president Daniel Sedwick. "Never before have we offered such a significant gold coin; the dual-nation history it represents goes far beyond a simple countermark." The coin (lot 83) represents the earliest known host for a regulated doubloon as well as being the only known regulated coin with the mark of Joseph Edwards, Jr. Edwards was a third-generation goldsmith from a prominent Boston family. He learned his craft from one of his uncles, Thomas or Samuel Edwards, and became a prosperous metalworker himself. His regulation mark on the coin appears as a simple I•E countermark in a rectangular indent pressed into the weight-adjusting plug. The plug and countermark reside at the foot of the lower-left lion, a seemingly random placement but perhaps chosen so that minimal coin design was lost in the process. The coin was previously owned by Julius L. Brown, son of Georgia governor Joseph E. Brown, and was sold as part of his estate in the May 1911 Lippincott, Son & Co. auction as lot 343. 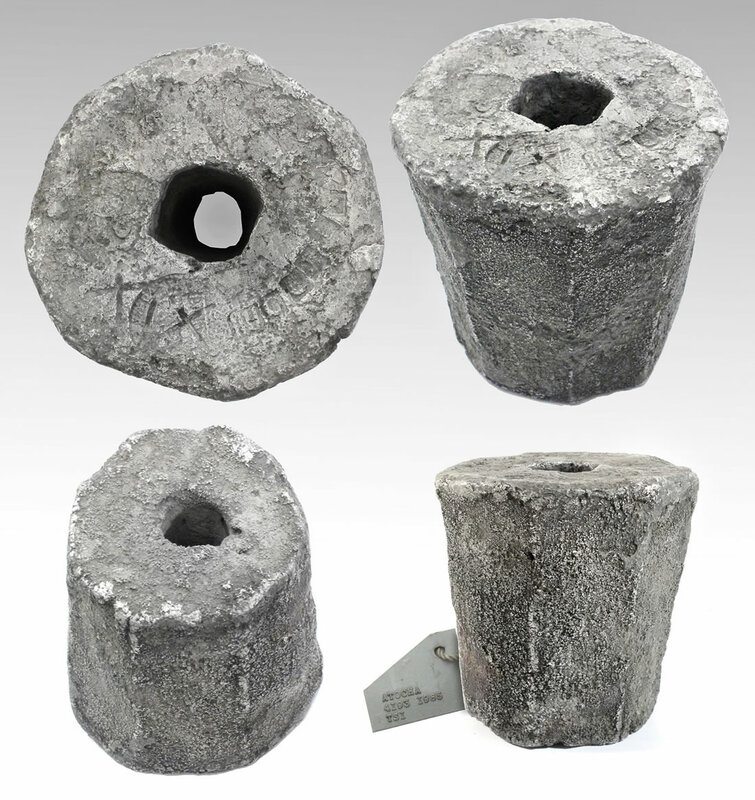 Also appearing in Sedwick’s auction is a group of ingots recovered from seven different shipwrecks. The top ingot lots are three large silver bars recovered from the Atocha, sunk in 1622 in the Gulf of Mexico. The finest one is a Class Factor 1.0-graded bar (the highest grade attainable for bars from the wreck) weighing in at 88 troy pounds, 3.84 troy ounces and dated 1621. It has an estimate of $30,000 and up. The other two large bars, with Class Factors 0.7 and 0.9, are estimated at $20,000 to $30,000 each. Another Atocha ingot of note in this auction is a rare cylindrical "piña" weighing 4,312 grams, estimated at $15,000 and up. 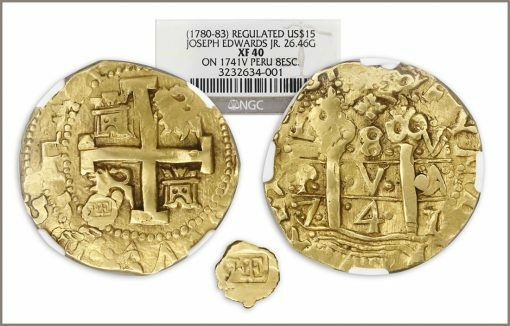 A Lima, Peru, gold cob 8 escudos dated 1712 recovered from the 1715 Fleet and graded by NGC as MS 62, estimated at $12,500. Half of a gold "finger" bar weighing 439 grams recovered from the "Golden Fleece wreck," sunk ca. 1550 in the northern Caribbean, estimated at $17,500 and up. A Costa Rica 8 reales 1846JB counterstamp on a Guatemala cob 8 reales dated 1739, estimated at $7,000 to $10,000. An 1856-S Coronet Head Liberty $20 graded by NGC as UNC Details / sea salvaged from the "Fort Capron treasure," estimated at $3,000 to $4,500. A Puerto Rico 20 pesos specimen bank note circa 1889 graded by PMG as Gem UNC 65 EPQ (the finest and only known example in the PMG census), estimated at $1,500 and up. Selections from the Richard Stuart collection mainly focusing on Honduras and Nicaragua provisional issues. The James Bevill collection of Mexican coins and paper money, including several plated in his Texas history book The Paper Republic. The Ricardo Muñiz collection of Mexico City, Mexico, pillar 1 reales. Bidders can register for the auction at auction.sedwickcoins.com. The auction catalog will is available at sedwickcoins.com. For more details, please contact Daniel Frank Sedwick, LLC at office@sedwickcoins.com.